Lawrence Wright, producer of HBO’s Alex Gibney “Going Clear” film, looks for any excuse to assassinate the character of the Scientology ecclesiastical leader. This includes scraping the bottom of the barrel to dig up long-expelled former Church members willing to say anything as long as it fits Wright’s agenda. This anecdote from Wright’s book involves discredited allegations spun to him courtesy of Ervin Scott, who was expelled from the Church not once, but twice. His invented tale even defies the laws of science and medicine. What’s more, Scott never even witnessed anything he claims happened. Yet Wright printed it anyway. On pages 165-168 in his book Going Clear, Wright accuses a 12-year-old David Miscavige of alleged bouts of violence directed against members of his own family and other fellow Scientologists when in the throes of severe asthmatic attacks. Let’s repeat that: Wright would have readers believe that a pre-teenage boy struggling to breathe during a debilitating asthma attack can still physically assault numerous people, including his own family. Why is this anecdote relevant to HBO? 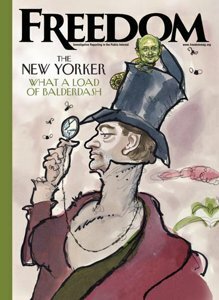 Because it strikes at the heart of Lawrence Wright’s credibility. 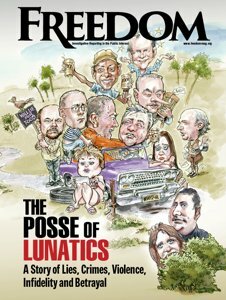 What Scott told Lawrence Wright was clearly bunk, yet he ran with it anyway. Given Wright is a producer of HBO’s film, HBO should be concerned about its credibility and legal exposure if Wright is willing to use such discredited sources as Ervin Scott to forward his propaganda. 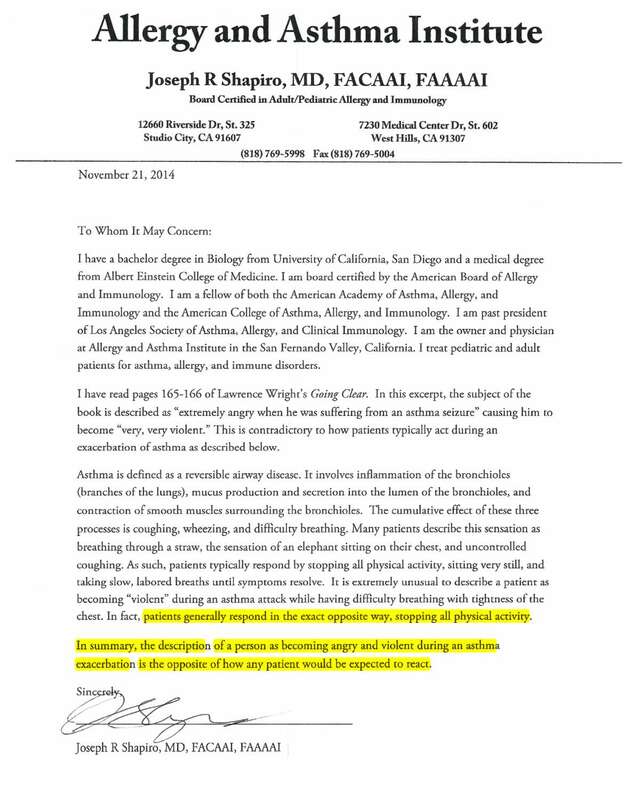 Wright exacerbates this defamatory lie by claiming that when Mr. Miscavige first started practicing his religion and was a minister in the Church, he “struck” a parishioner whom he was auditing (Scientology religious counseling). This is a perfect illustration of the animus and bigoted agenda of Wright and the obsessed, bitter sources he relied almost exclusively upon throughout his book. Wright is using this absurd allegation from a person who is a liar in an effort to undercut the credibility of Mr. Miscavige as the leader of the religion. So how did this tale get started? 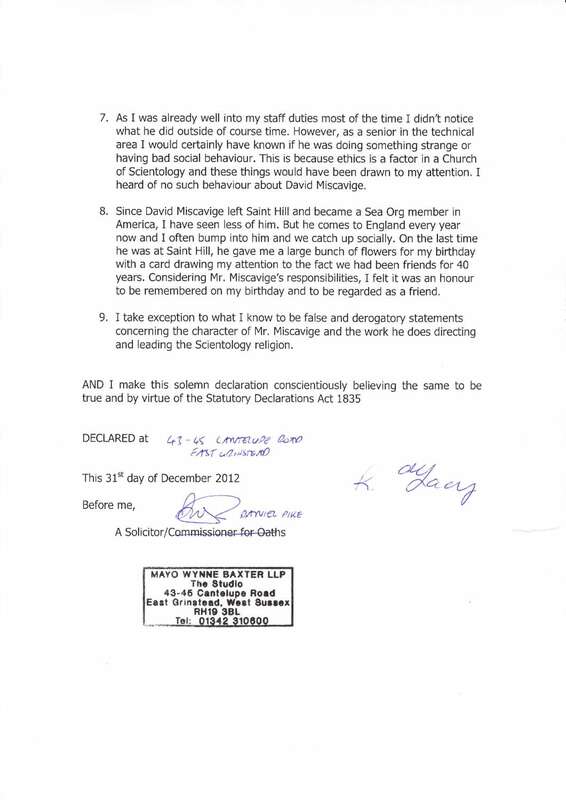 Wright used Scott’s “memory” of David Miscavige’s boarding with him in England. 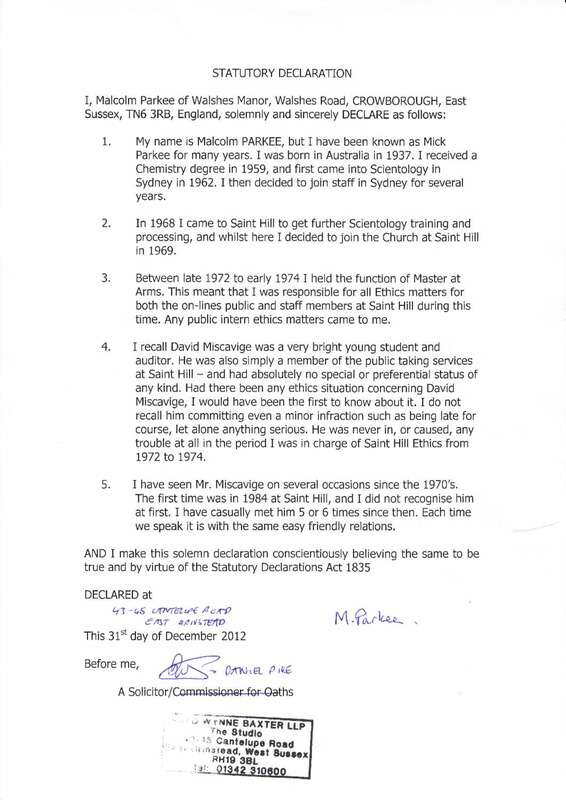 But records show Scott was there at a different time and had a different address than Mr. Miscavige who had completed his academy training months prior to Scott. Mr. Miscavige never boarded with Scott. He lived with his family who at no time left him in England when they returned to the U.S. The entire story is absurd. Any honest and intelligent journalist would recognize it immediately as ridiculous. 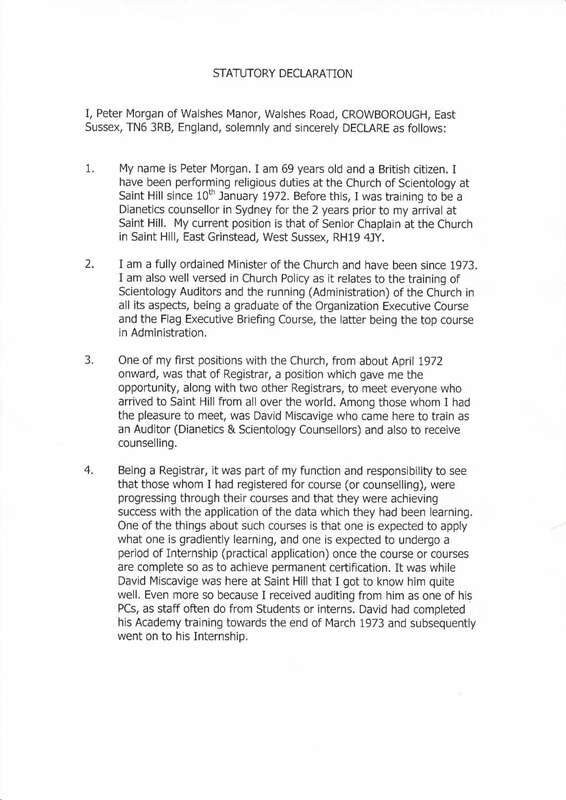 To print such an easily contradicted story that allegedly took place four decades ago about a religious leader, in a pathetic attempt to undermine his training in the ministry, is unethical. Nowhere does Mr. Wright furnish a single citation in the “Notes” appended to his book to support any portion of Scott’s account, including the reporting of David Miscavige’s alleged “violence” as a 12-year-old. 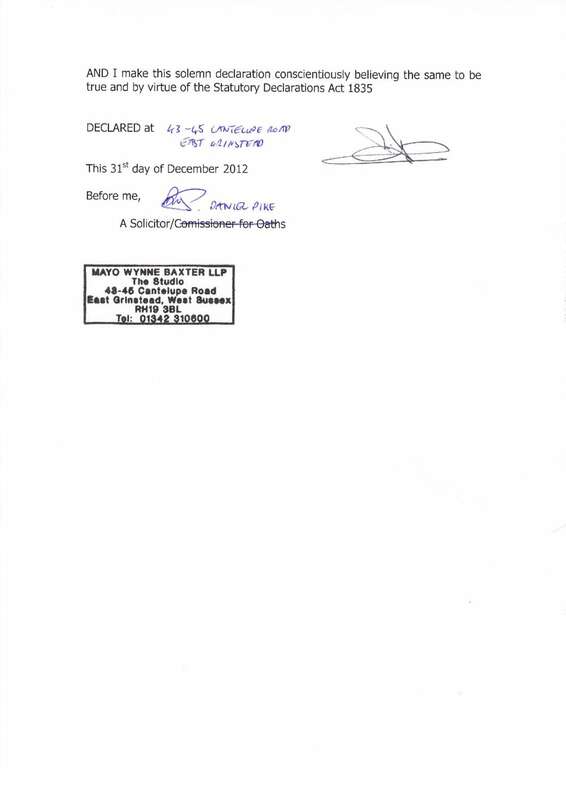 The lone attribution is to a claimed “Interview with Ervin Scott” at an unspecified time and location. 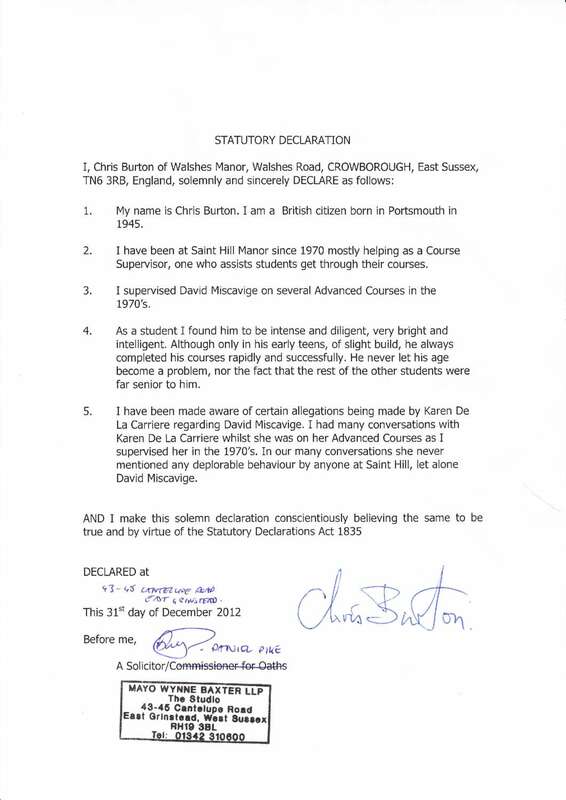 The utter failure of Wright to properly vet Scott’s tale and provide any specific citation to corroborate Scott’s defamatory allegations speaks volumes about his decisions to rely on discredited anti-Scientology sources. 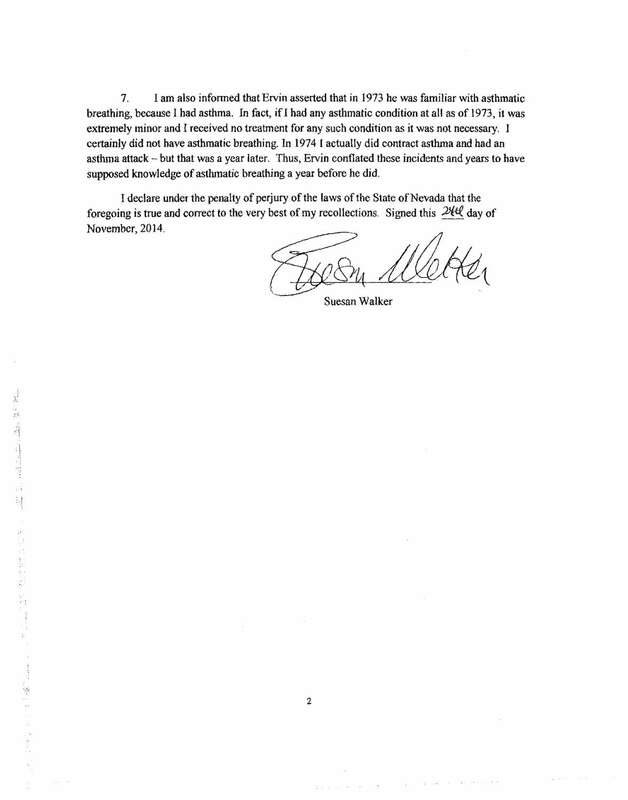 Specifically, Ms. Walker, who Wright never bothered to contact to corroborate what Scott claimed, outright refutes her ex-husband’s story about Mr. Miscavige. At the time, she, too, was in England while Scott studied at Saint Hill and stayed with him during visits in the relevant time period. According to Ms. Walker, Scott’s room was too small to share it with Mr. Miscavige or anyone else. And her husband never even referred to any such incident. He never even mentioned he knew Mr. Miscavige or that he had a roommate. This egregious error could have been avoided by Wright. During the minimal fact-checking of his book, the Church asked repeatedly for the name of the person who had made these allegations, precisely because the Church suspected it came from someone like Scott with no credibility. 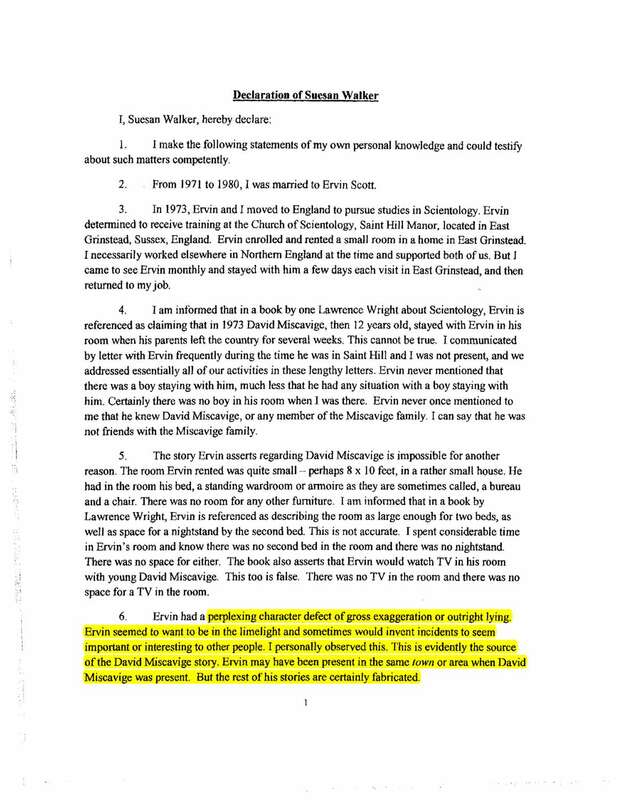 Knowing the Church could discredit Scott as a liar, Wright refused. Had Wright revealed Scott’s name, the Church would have presented the information, corroborated by records, showing that Scott’s claim defies logic and that he was never even in a position to witness what he claims, let alone that these events even occurred. So can one trust Wright as producer of HBO’s documentary? More importantly, can HBO trust the sources he teed up for Alex Gibney, given they are so motivated by revenge and hatred to the point that they will say anything, as Scott has proven? The unequivocal answer is “No.” Furthermore, it is mind-boggling that Wright’s obsession with denigrating the Scientology leader runs so deep as to print a phony anecdote about him when he was 12 years old. The only reason this passage even appears in his book is because Wright is hell-bent on character assassination and wants to set up the false allegations of Marty Rathbun—accusing Mr. Miscavige of conduct that never occurred—and at the beginning of his Scientology life. Wright is journalistically corrupt, and HBO’s decision to use him as a producer means HBO is participating in that corruption. Ervin Scott is one important example. For six years a small handful of bitter ex-Scientologists have spun more tales and myths than can be counted about the Church and Mr. Miscavige. Stories appear out of nowhere that are miraculously “remembered” years later. Stories morph over time into two, three and four new versions, often entirely different from previous ones. And stories are full of contradictions that would cause any skeptical journalist to question the credibility of the sources. The bottom line is that he is yet another bitter, angry disciple of Marty Rathbun, an admitted liar who is unable to get over his humiliation at having been removed from his position in the Church for his personal conduct and malfeasance. Scott is a core member of Rathbun’s self-proclaimed “posse” formed in 2009 to attack the Church. He has even received offbeat counseling like that delivered by Rathbun. HBO aligned itself with Mr. Wright and his consortium of liars while refusing to vet their allegations, embarrassing itself for its bigotry and propaganda. It is not possible for HBO and Alex Gibney to ignore the volumes of material documenting Lawrence Wright’s lies and distortions. The very individual who got it so wrong to begin with is in the middle of this documentary as a producer, and his bias infects every frame. This is a bright red flag HBO and its attorneys should not have ignored.